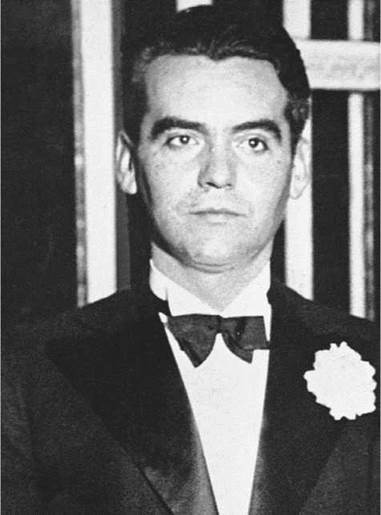 Federico Garcia Lorca. Lorca, Federico Garcia, photograph. AP images. Federico Garcia Lorca’s reputation rests equally on his poetry and his plays. He is widely regarded as Spain’s most distinguished twentieth-century writer. Garcia Lorca was a major participant in the flowering of Spanish literature that occurred over the years between World War I and the Spanish Civil War, and he is normally categorized as a leading member of the group of artists known as the Generation of 1927. Arabic Roots. Garcia Lorca was born and raised in rural Andalusia, the southernmost province of Spain and a region greatly influenced by Arabic and Gypsy culture. The major points in Garcia Lorca’s life and career often seem to have coincided with significant events in the historical and political arena. For instance, the year of his birth coincided with the so-called Disaster of 1898, when Spain received a stunning double shock in losing the war against the United States and hence losing also its last remaining colonies: Cuba, Puerto Rico, and the Philippines. Garcia Lorca spent his first eleven years on the vega (fertile plain) of Granada, to the west of the city, his family dividing its time between two villages, Fuente Vaqueros and Asquerosa. His father, Federico Garcia Rodriguez, was a well-off farmer and landowner; Garcia Lorca’s mother, the former Vicenta Lorca Romero—his father’s second wife—was a local primary-school teacher. Both parents, but particularly his mother, are thought to have exerted in their different ways a strong influence on Garcia Lorca’s character and sensibility. The loss of Cuba in the war meant that Spain’s supply of sugar was cut off. The consequent boom in the market for sugar beets, which thrived in the vega's soil, and his father’s canny business sense enabled the family to consolidate its financial position, and hence, incidentally, to support Garciia Lorca economically throughout almost the entirety of his life. He attended schools in the nearby town of Almeria and studied law and literature at the University of Granada. After moving to Madrid in 1919, Garcia Lorca continued his studies at the Residencia de Estudiantes, a center for writers, critics, and scholars of cultural liberalism. The Generation of 1927. While in Madrid, Lorca earned a law degree and came in contact with several emerging literary and artistic figures, many of whom would later comprise the Generation of 1927. The members of this group rejected what they considered to be the sentiment and superficiality of Romanticism and instead advocated hermetic expressionism. Garciia Lorca's closest friend at the Residencia de Estudiantes was Salvador Dali, whose dramatic surrealist paintings and ‘‘quest for joy for the sake of joy'' would later inspire Garciia Lorca to write ‘‘Ode to Salvador Dali.’’ Another prominent figure of this period was poet Juan Ramdn Jimenez, whose use of symbolism influenced Garciia Lorca's first volume of poetry, Libro de poemas (1921). This work is a compilation of Gypsy folklore Garciia Lorca heard during his youth in Andalusia. Although considered a conventional account of his childhood experiences, Libro de poemas is recognized for its vivid, accessible language and mythological imagery. After the publication of this volume, Garcia Lorca organized Spain’s first cante jondo (deep song) festival. Cante jondo is a traditional form of Andalusian music that, according to drama historian Felicia Hardison Londre, ‘‘combines intensely emotional yet stylistically spare poetry on themes of pain, suffering, love, and death with a primitive musical form.’’ Garcia Lorca's continued involvement in the cante jondo festival, at which Spain's most famous singers and guitarists performed, is reflected in Canciones (1927) and Poema del cante jondo (1931). These collections, which were directly inspired by composer Manuel de Falla, elevated the traditional ballad forms known as siguiriyagitano and solea to new levels of stylization. The ‘‘Gypsy Poet’’. The years 1924 to 1927 were also a time, after the closure of the Poema del cante jondo/ Canciones phase, when Garciia Lorca became engaged in a wide-ranging exploration of very different modes of poetic writing. One vein, or direction, is represented by what turned out to be Garciia Lorca's most successful, most popular, and best-known collection of poetry, Gypsy Ballads (1928). The process of gestation was a fairly lengthy and leisurely one. While a primitive version of ‘‘Ballad of Don Pedro on Horse-back’’ dates back to late 1921, the concept of a series of Gypsy ballads and the composition of several of the poems can be ascribed to the summer of 1924. Others followed in subsequent years, and several appeared in small magazines (19261928) before the collection was completed in 1927 and published in mid-1928. While not as well known as Gypsy Ballads, Lament for the Death of a Bullfighter, and Other Poems (1935) is also considered a masterpiece. This four-part elegy was occasioned by the mauling death of Spain's most celebrated matador, Ignacio Sanchez Mejias, who was one of Garcia Lorca’s closest friends. A celebration of Spanish sound, rhythm, and assonance, Lament evidences Garciia Lorca's unique blend of poetry and drama. Stereotypes and Industrial Life Provoke Poetic Crisis. Despite the fact that Garcia Lorca’s work was extremely popular throughout the 1920s, the poet suffered an emotional crisis in 1928, stemming from his belief that he was being stereotyped as a ‘‘gypsy poet.'' Leaving the Andalusian landscape with which he was so familiar, Garcia Lorca traveled to New York City in 1929, where he came in contact with images directly contrasting those of his homeland. Deeply disturbed by the monotony of industrial life and America's reliance on mechanization, Garciia Lorca began writing verse that was later collected in the posthumous volume Poet in New York (1940), considered to be his most abstract and surrealistic volume due to its themes of chaos and alienation. Although Garciia Lorca wrote the drama The Spell of the Butterfly in 1920, it was not until he returned to Spain in 1930, shortly after the proclamation of the Spanish Republic, that he composed the majority of his dramatic works. Among his best-known plays are Blood Wedding (1933), Yerma (1935), and The House of Bernarda Alba (1945). Tragic Passion. Blood Wedding, which closely resembles a classical Greek tragedy, is the story of a bride who runs off with another man on her wedding day. In contrast to Blood Wedding and the similar follow-up Yerma, which are generally considered expressionistic and abstract, The House of Bernarda Alba is intensely realistic. This work focuses on Bernarda, a tyrannical woman who virtually imprisons her five daughters in her home. In 1936, an army coup against the government of the Second Spanish Republic resulted in the start of the Spanish Civil War, a three year conflict that resulted in the founding of the dictatorship of General Francisco Franco, a nationalist. The political unrest forced Garcia Lorca into hiding, despite the fact he had never aligned himself with any particular political party and referred to himself as a ‘‘Catholic, communist, anarchist, liberal, conservative, and monarchist.’’ Garcia Lorca was eventually discovered at the home of a friend and arrested by Franco’s Nationalists. Garcia Lorca had the misfortune of being in the wrong place at the wrong time. He was well known as a man of the arts, liberal minded, rumored to be homosexual, a member of a family on intimate terms with socialist leader Fernando de los Rios, and, therefore, as far as the opposing side was concerned, an enemy beyond a shadow of a doubt. After being detained by the civil government in Granada for several days, Garcia Lorca was executed by a firing squad in an olive grove outside the tiny village of Viznar and buried in an unmarked grave. His murder is often considered a tragically ironic ending for an author who so frequently wrote about death. Scholars maintain, however, that although death is a prevalent theme in his works, Garcia Lorca is perhaps more strongly esteemed for his abiding humanitarian concerns, deep affection for Andalusian culture and landscapes, and passionate dedication to all art forms. Luis Bunuel (1900-1983): One of the most influential film directors of the twentieth century, Bunuel was a close friend of Garcia Lorca and surrealist painter Salvador Dali. Ricardo Garcia Lopez (1890-1984): Known best by his pseudonym, K-Hito, Lopez was a cartoonist, humorist, magazine publisher, and bullfighting critic closely associated with the Generation of 1927. Felipe Alfau (1902-1999): Although associated with Spanish poets like Garcia Lorca, Alfau wrote in English. His work is seen as a forerunner to postmodernist writers such as Vladimir Nabokov and Thomas Pynchon. Francisco Franco (1892-1975): Leader of the Nationalists during the Spanish Civil War, Franco would go on to become the dictator of Spain until his death nearly forty years later. Garcia Lorca drew upon all elements of Spanish life and culture to create poetry at once traditional, modern, personal, and universal. Combining classical verse with folk and Gypsy ballads, Garcia Lorca sought to liberate language from its structural constraints and bring out the musicality inherent in Spanish dialect. While initially influenced by the symbolists, who believed the function of poetry was to evoke and not describe, Garcia Lorca began to experiment with startling imagery, scenic metaphors, and complex rhythms after coming in contact with filmmaker Luis Bunuel, poet Pablo Neruda, and artist Salvador Dali. Garcia Lorca’s dramatic approach to poetry led him to devote the latter part of his life to playwriting. In his drama, like his verse, Garcia Lorca wrote about death, frustrated sexuality, and the relationship between dream and reality. While his poetry and drama continue to be widely studied among literary scholars, Garcia Lorca emphasized that he wrote for and about common people. New and Traditional Poetic Structures. By the time Libro de poemas was in the bookshops, Garcia Lorca had already turned his back on the kind of writing it exemplified, focusing instead on a new manner that would absorb him for the next four or five years. He opted for short, often minimal lines, arranged in loosely structured patterns, often employing parallelism, repetition (sometimes with internal variation), exclamations, unanswered questions, and ellipses; the resulting short poems were arranged in thematically grouped sequences he called suites. By contrast, the eighteen poems of the Gypsy Ballads are all written in the traditional octosyllabic (eight syllables per line) ballad meter, whose origins go back at least as far as the fourteenth century and which had been perpetuated in a continuous oral tradition down to Garcia Lorca’s times. Garcia Lorca, along with the other members of the Generation of 1927, played an influential role bridging the gap between classical Spanish literary tradition and the European avant-gardes that came after him. Antigone, (fifth century BCE), a play by Sophocles. This work, an ancient Greek tragedy, follows the moral dilemma of a woman who acts against the will of the state, which has declared her deceased brother not be granted a funeral. A Doll's House (1879), a play by Henrik Ibsen. Highly controversial when first written and performed, this work catapulted Ibsen to international fame (and infamy) on the strength of its sharp criticism of the traditional roles of men and women in the nineteenth century and, in particular, the institution of marriage. Pygmalion (1913), a play by George Bernard Shaw. Shaw transforms an ancient myth into a modern story about a professor who turns a Cockney flower girl into a proper society lady. A Streetcar Named Desire (1947), a play by Tennessee Williams. Known for his taut portraits of families in crisis, this work is perhaps Williams's best-known work—a drama of elemental passions in which a vibrant couple is challenged by the arrival and decline of an unstable heroine. It has been argued that Garcia Lorca’s untimely death at the hands of a firing squad, some five weeks after the outbreak of civil war, transformed him into a martyr figure for antifascists from all around Europe. Be this as it may, his enduring and increasing popularity and the richness and profundity of his works show that his status as a modern classic has a sound foundation. The Gypsy Ballads. Garcia Lorca’s The Gypsy Ballads (1928) is widely regarded as a masterpiece of Spanish poetry. In this volume, composed of eighteen poems written between 1924 and 1927, Garcia Lorca incorporated images of Gypsy village life with traditional ballad forms to create verse both thematically accessible and lyrically complex. Utilizing such dramatic elements as action, characterization, and dialogue, Garcia Lorca created what Londre described as ‘‘symbolist dramas in miniature.’’ Since its publication, The Gypsy Ballads has been popular in Spanish-speaking countries worldwide due to its focus on common people and its use of idiomatic language. C. M. Bowra explained: ‘‘[The Gypsy Ballads] is a book which has a special place in our time because it shows not only that the outlook of a highly civilized poet is in many ways that of the simplest men and women, but that the new devices which have been invented to express a modern sensibility are not restricted to urban and sophisticated subjects.’’ Although The Gypsy Ballads brought Garciia Lorca widespread acclaim, it also led both readers and critics to categorize him as a ‘‘gypsy poet,’’ a label Garciia Lorca would repudiate throughout his life: ‘‘Gypsies are a theme. Nothing more. I would be the same poet if I wrote about sewing needles or hydraulic landscapes. Besides, the gypsy myth makes me sound like an uncultured, uneducated, primitive poet, which ...I am not,’’ he once explained. 1. Garcia Lorca has been called ‘‘the poet of the Gypsies.’’ Citing specific examples from his work, describe the aspects of Garcia Lorca’s writing that earned him that label. 2. Choose one of Garcia Lorca’s plays and analyze the themes, beliefs, and customs contained within. What can the play tell you about Spanish culture? What can the play tell you about Garcia Lorca’s political beliefs and the political climate of Spain in the 1920s and 1930s? 3. Garcia Lorca was associated with the symbolist movement. Identify and discuss the symbolist elements of Garcia Lorca’s writings. 4. The chorus in Greek tragedies is echoed in Garcia Lorca’s Blood Wedding. Research the ancient Greek chorus and compare it with Garcia Lorca’s chorus in the play. Which elements are the same? Which are different? Adams, Mildred. Garcia Lorca: Playwright and Poet. New York: G. Braziller, 1977. Allen, Rupert C. The Symbolic World of Garcia Lorca. Albuquerque: University of New Mexico Press, 1972. Anderson, Andrew A. Lorca’s Late Poetry: A Critical Study. Leeds, U.K.: Francis Cairns, 1990. Byrd, Suzanne Wade. Garda Lorca, La Barraca, and the Spanish National Theater. New York: Abra, 1975. Cavanaugh, Cecelia J. Lorca’s Drawings and Poems: Forming the Eye of the Reader. Lewisburg, Pa.: Bucknell University Press, 1995. Colecchia, Francesca, ed. Garcia Lorca: A Selectively Annotated Bibliography of Criticism. New York: Garland, 1979. Gibson, Ian. The Assassination of Federico Garcia Lorca. London: W. H. Allen, 1979. Galens, David M., ed. ‘‘The House of Bernarda Alba.’’ In Drama for Students. Vol. 4. Detroit: Gale, 1998. Hacht, Anne Marie, ed. ‘‘Gacela of the Dark Death.’’ In Poetry for Students. Vol. 20. Detroit: Gale, 2004. LaBlanc, Michael L., ed. ‘‘Blood Wedding.’ In Drama for Students. Vol. 10. Detroit: Gale, 2001. Morris, C. Brian. Son of Andalusia: The Lyrical Landscapes of Federico Garcia Lorca. Nashville: Vanderbilt University Press, 1997. Perna, Michael L., ed. Dictionary of Literary Biography. Vol. 108: Twentieth-Century Spanish Poets. First Series. A Bruccoli Clark Layman Book. Detroit: Gale, 1991. Pollin, Alice M., and Philip H. Smith, eds. A Concordance to the Plays and Poems of Federico Garcia Lorca. Ithaca, N.Y.: Cornell University Press, 1975. Soufas, C. Christopher. Audience and Authority in the Modernist Theater of Federico Garcia Lorca. Tuscaloosa: University of Alabama, 1996.